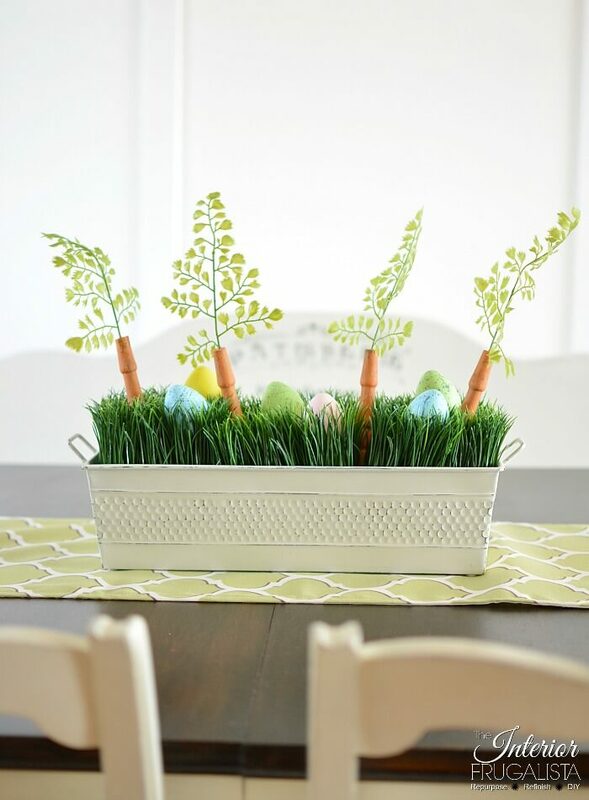 Today I'm sharing a whimsical and budget-friendly upcycled Easter centerpiece box idea that includes two easy and fun DIY's to embellish it. 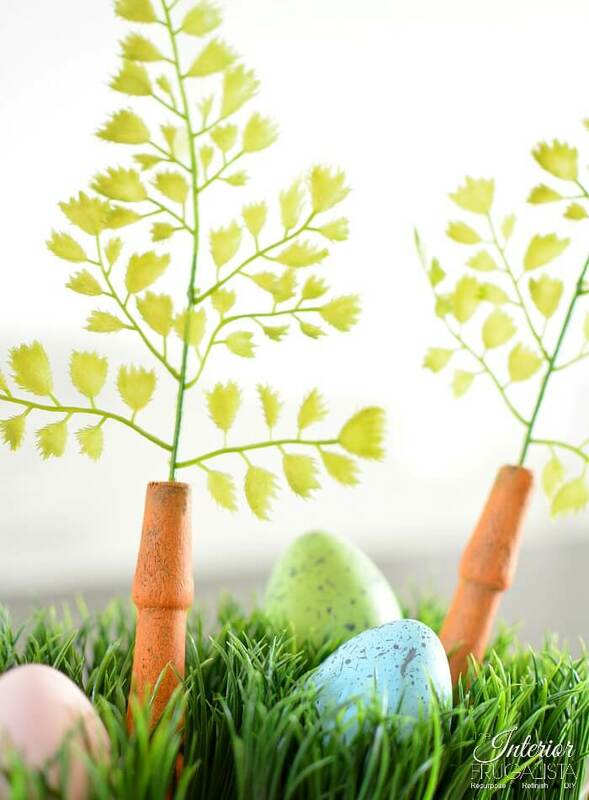 You may have everything you need on hand to make one for your Easter table this year. If not, a trip to both the dollar store and your local thrift store should have you covered. 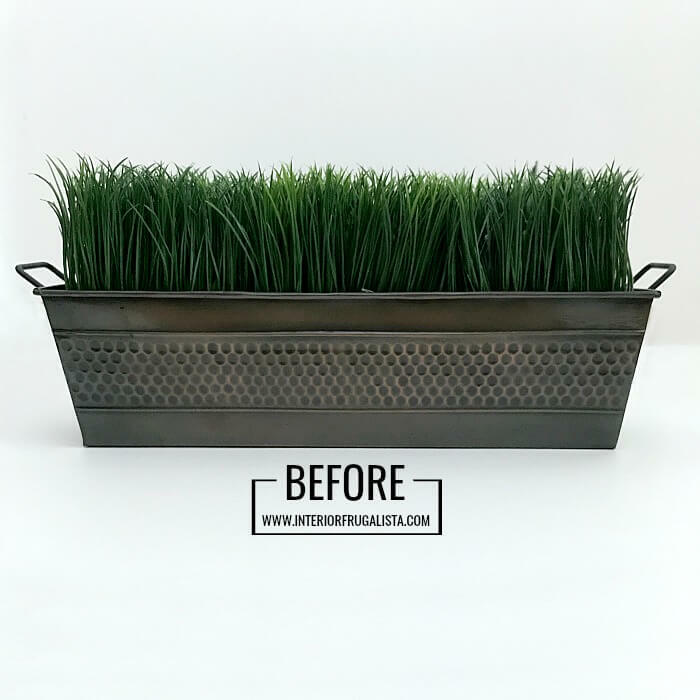 For well over a decade I've had a long bronze metal planter that came filled with artificial wheatgrass on our basement fireplace mantel collecting dust. It was the perfect height for the narrow gap between the mantel and the large television hanging above. 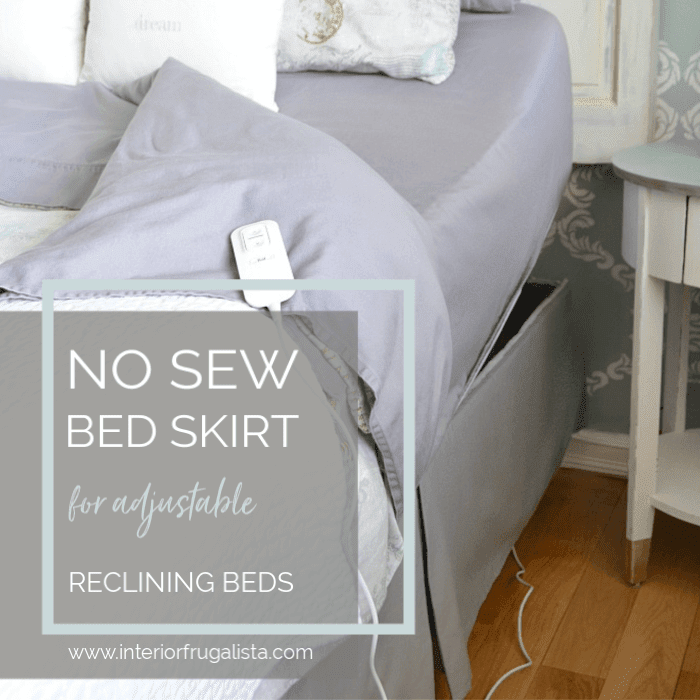 But I can't tell you how many times over the years I'd tell myself to get rid of the darn thing because I didn't know what else to do with it. Then a few weeks ago I had a lightbulb moment when I saw my friend Sarah from Sadie Seasongoods hobnail milk glass Easter vases and my thoughts immediately went to my long-neglected tin planter. 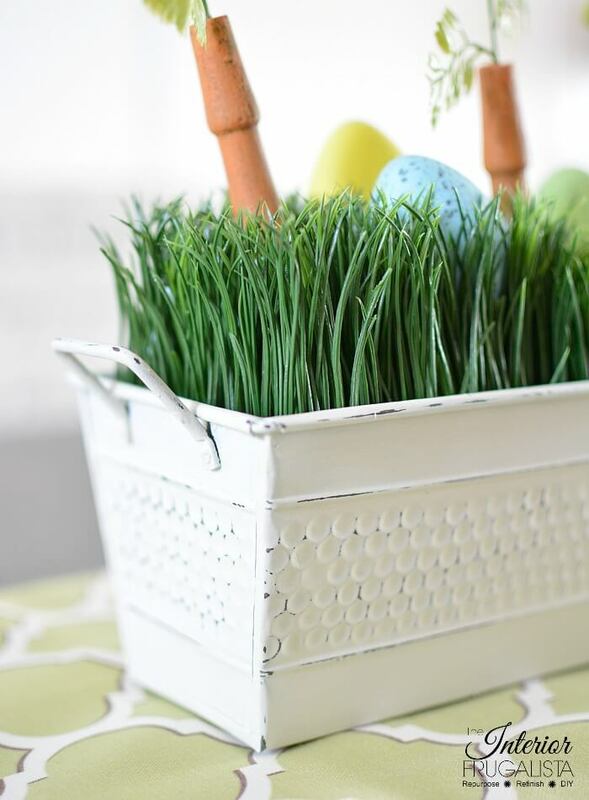 With just a little white paint I gave the bronze planter a fresh new look and then planted some fun chair spindle carrots and DIY speckled Easter eggs into the faux grass to make an adorable whimsical centerpiece for our Easter table this year! 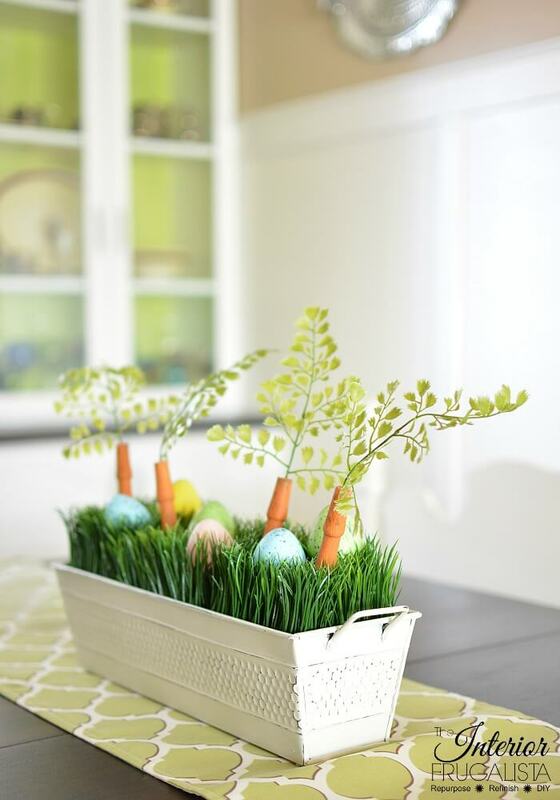 Any tin, metal, wood, plastic, or glass vessel will work for this centerpiece, all you need is some faux OR real wheatgrass to fill it. I'll show you how easy it is to make the DIY speckled eggs further down in this post. ...and the adorable chair spindle carrots. 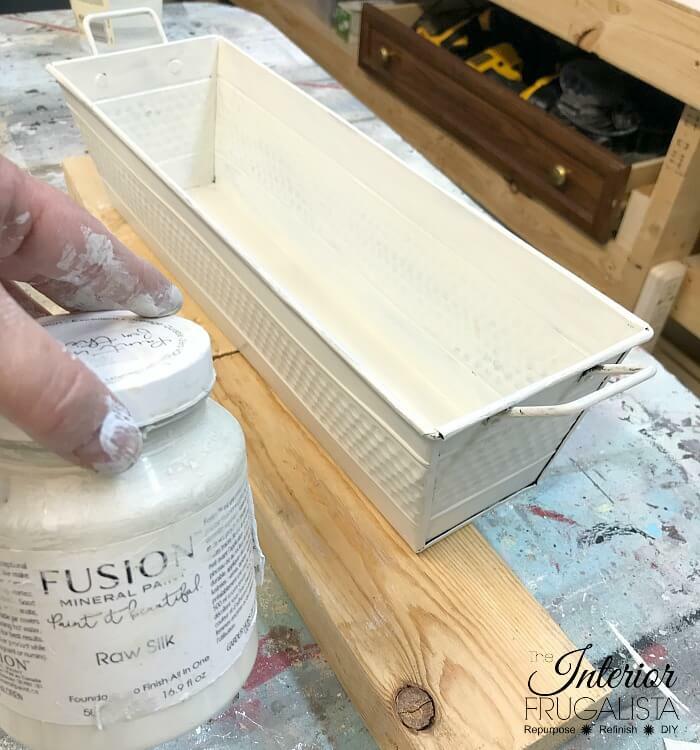 But if rustic Farmhouse wood planters are more your taste, I share a couple of tutorials on how to make two different styles in my Rustic Wedding Centerpiece Boxes post and Christmas Planter Box post. Let's take a look at my bronze planter before I refreshed it with paint. What a difference a little white paint made, wouldn't you agree? I painted the bronze tin planter with two coats of Fusion raw silk mineral chalk paint both inside and out. Once the paint dried I distressed it with 220-grit sandpaper and protected the paint with a coat of clear wax, buffing to a matte finish. While the wax was curing I set about to clean the dusty faux wheatgrass mats by setting them in the kitchen sink and using the spray nozzle. While the grass was drying on a towel I filled the centerpiece box 2/3 full with pea gravel from the dollar store. 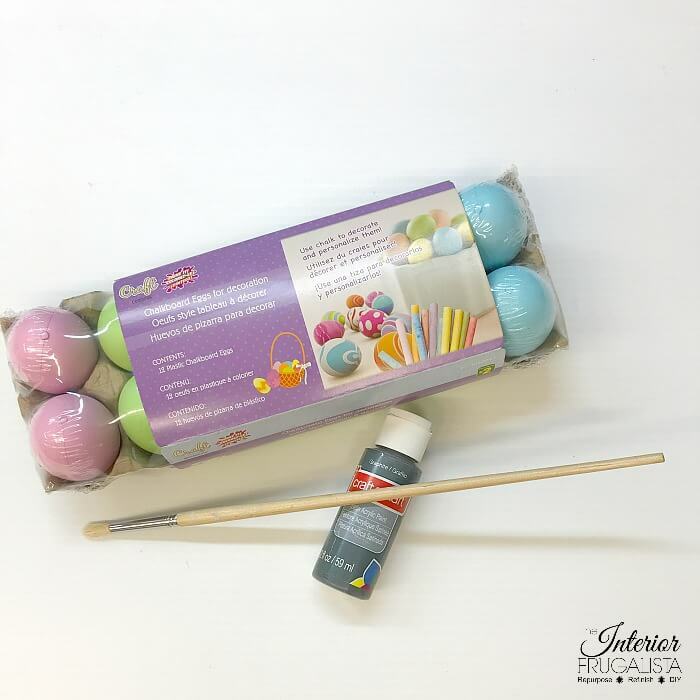 You can make DIY speckled eggs in less than five minutes with colored chalkboard plastic eggs from the dollar store - no painting required! Of course, you can use the real thing too. You will need some dark grey or charcoal craft paint and either a paintbrush or toothbrush. Squirt a little graphite craft paint onto a paper plate and dilute with a drop or two of water. Dip the brush into the paint and flick the bristles on the brush to spray flecks of paint onto the eggs. Well, it wasn't so funny at the time. I set myself up on a table on the far end of the workshop and had my eggs set in an egg carton inside a cardboard soda pop tray to keep my work surface clean. Apparently, I was having too much fun with the paint splattering because on the opposite side of the room, I had just finished the last coat of paint on my Pink Ombre Waterfall Dresser. You probably guessed where I'm going with this. Not only did I have speckled eggs but a speckled pink dresser too! Panic set in because it isn't quick and easy to paint furniture ombre, especially considering it was my first time trying the technique. Thankfully I was able to wipe the grey specks with a damp cloth before they dried. I've had a bucket of old chair spindles in the workshop for years. I made this Chair Spindle Snowflake with some of them and used others as Fabric Pumpkin Stems. I was happy to put the smallest of the spindles to good use with these faux carrots. I found the artificial greens to use as carrot tops at the dollar store. Clean up the ends of the chair spindles by trimming them with a miter saw. 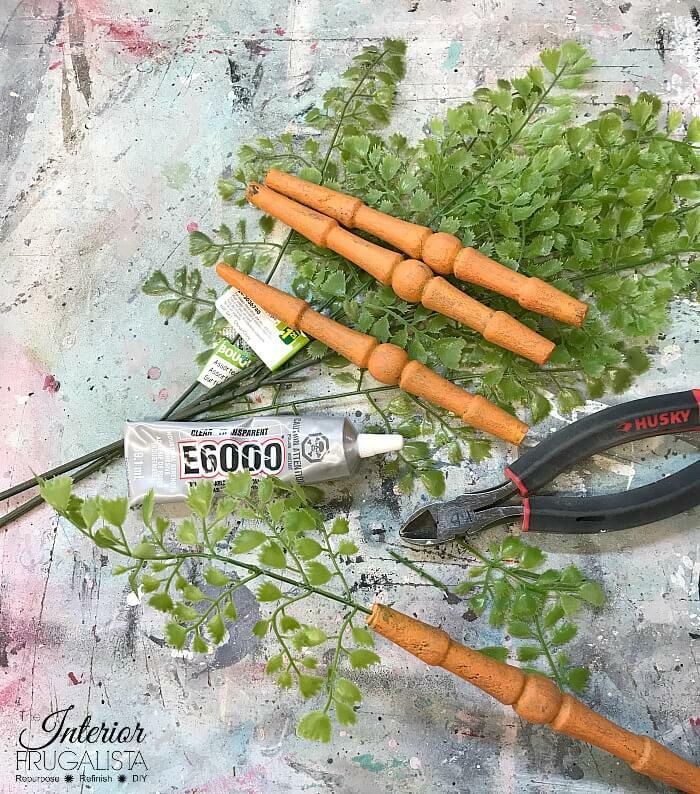 Paint them to look like real carrots with dry brushed layers of paint. To dry brush, all you do is dip just the tips of your paintbrush into the paint so there is very little paint on the brush. With little pressure on the brush paint random brush strokes so the dark stain still shows in spots. Starting with the darkest orange paint color (sorry it's a custom color that I mixed ages ago and forgot to label). Once dry to the touch (mere minutes) dry brush a layer of yellow paint (Annie Sloan Chalk Paint in the color Arles). Repeat for the final lighter orange craft paint color. 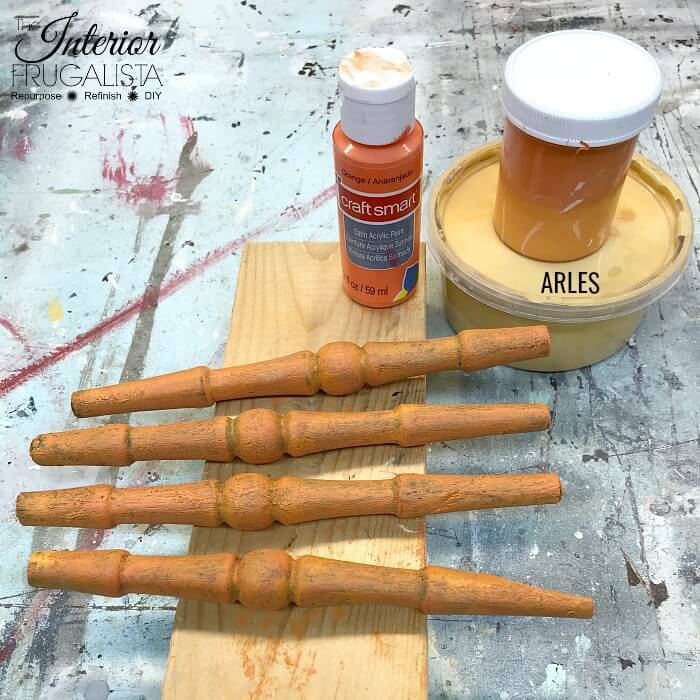 Once the paint is dry, poke a hole in the center of each spindle at the top with an Awl. 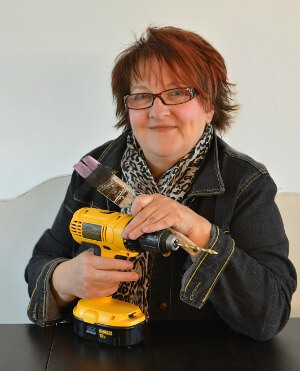 Drill a hole for the faux carrot top greens with a small drill bit the same size as the stems on the faux greens. 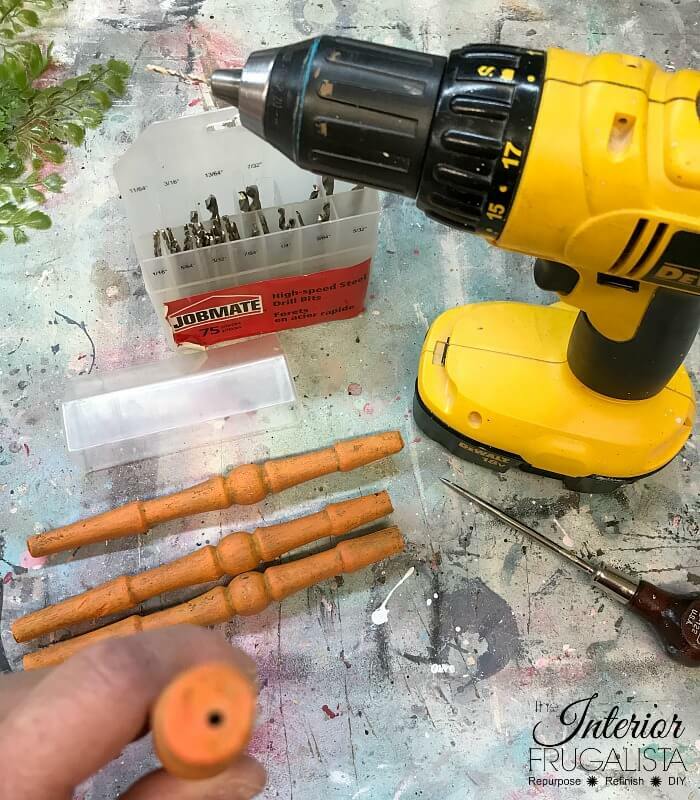 Clip the faux greens with wire cutters, put a dab of E6000 glue on the ends of the stem, and slip them into the spindles (as pictured below). Place the three now clean and dry faux wheatgrass mats on top of the pea gravel. Push the carrots through the grid of the faux grass and then through the pea gravel to hold in place. 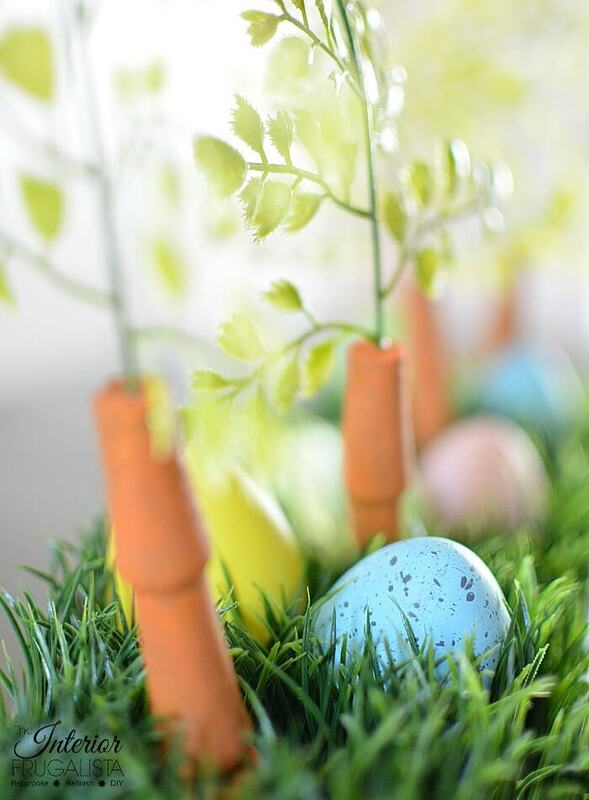 Nestle the speckled eggs in the grass between each carrot. I mixed both speckled eggs and plain colored ones in my centerpiece. That's it - how adorable is this? 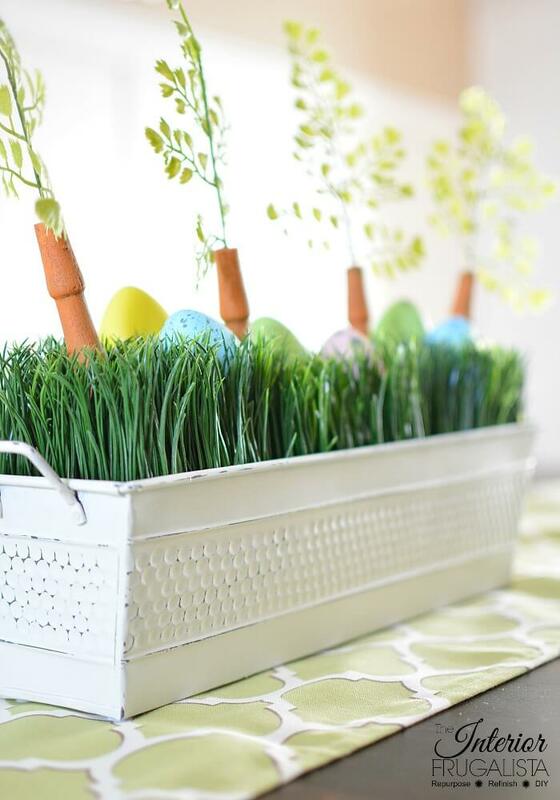 For more DIY inspiration visit my Spring & Easter Ideas page and/or my Spring|Easter Board on Pinterest. How sweet, I love your little carrots! 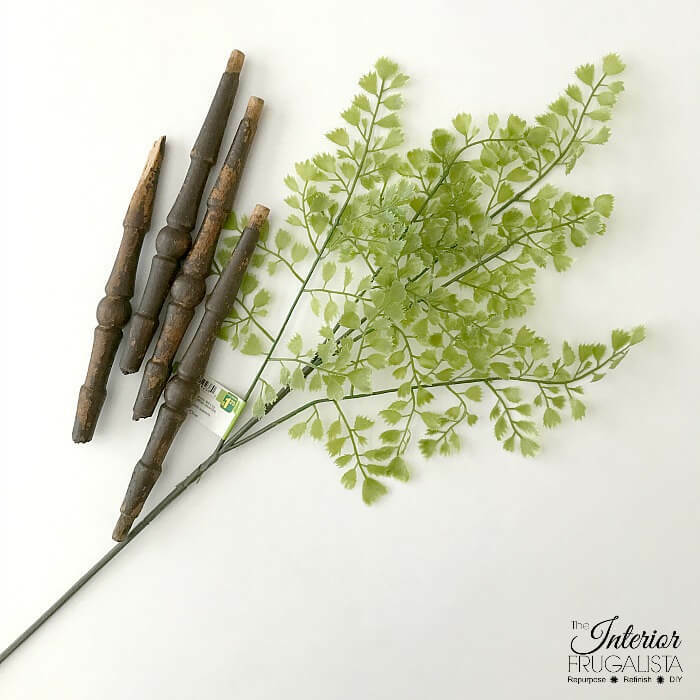 I have some spindles and was looking at them the other day, thinking of making them into carrots too... thing is they are very long and I can't bear to cut them down the amount I would need to... I'll have to look at them again though... yours are SO cute!! Thanks Tania! I have some longer spindles too and couldn't bring myself to cut them down. But if they will work by cutting them in half, at least you can get 4 carrots from just two spindles. Marie the centerpiece is definitely better in white. Those spindles are doing great disguised as carrots and I never would have thought to do that. I also like the idea of the speckled eggs, I think I may have a few plastic ones around that I can also update. Happy Easter dear friend. It seems as if time is just flying by. Thank you Mary, I think the centerpiece box looks so much prettier in white too! I can't believe it took me ten years to think of using it for Easter. Don't do what I did when speckling your eggs! LOL Yes my sweet friend, time is just flying by. Thank you Denise 😊 I'm happy to finally put the metal planter box to a better use! My grandson is going to love it when he sees it on the dining table. Thank you, I'm glad you like this idea for Easter. I hope you find just the right container at a decent price to make one. How fun though to attend farm country auctions. I bet they have some amazing stuff! 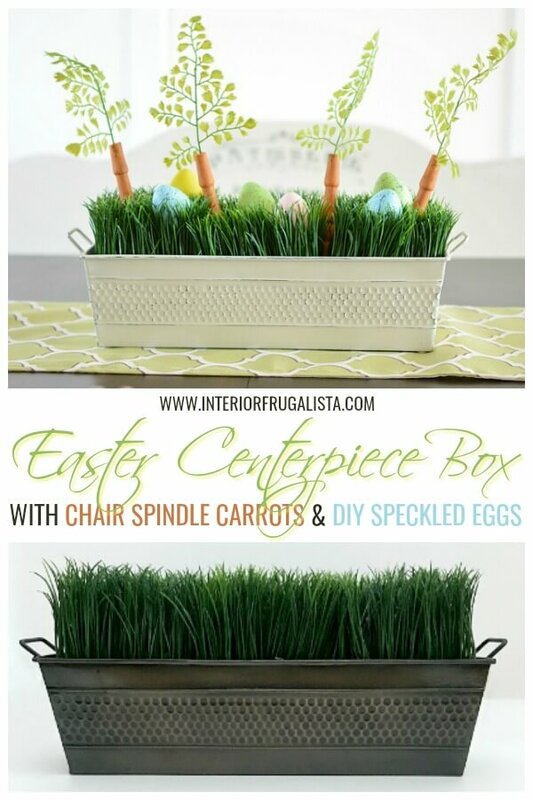 I am absolutely loving those chair spindle carrots-so stinkin' cute! And I've got a pot of grass like that too...I might be doing this whole thing! 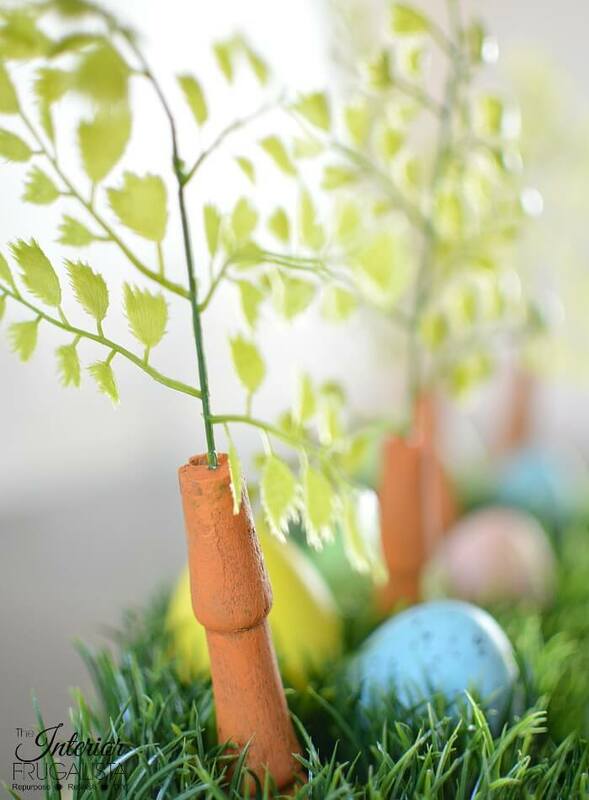 What a fun centrepiece. 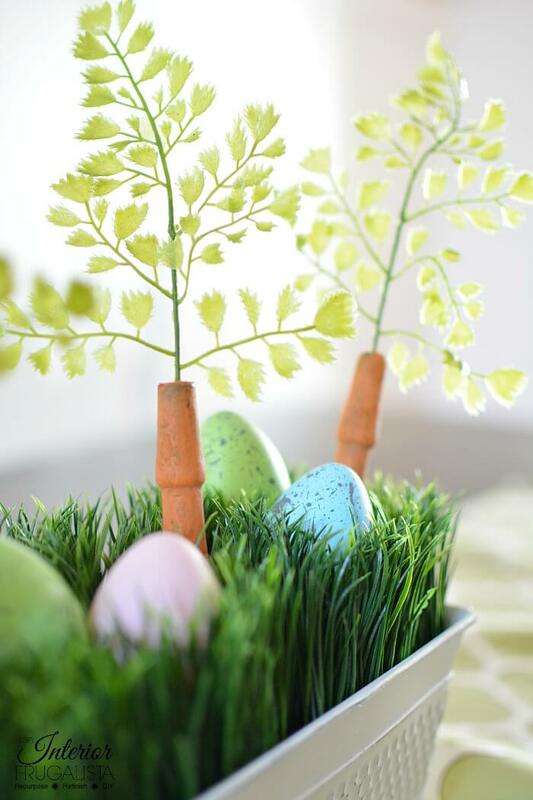 I love the way you made those carrots and the speckles eggs, although I would have had a heart attack if I saw the speckles on the ombre dresser. Thank goodness you could wipe them off in time. Thank you Michelle! I can't wait for my grandson to see the carrots because he'll get a huge kick out of them. Yeah, a few colorful words may have been strewn during the speckled dresser debacle. So cute. Those spindles make perfect carrots. So clever. Thank you, I was happy to finally put the metal planter to a good use! The inspiration for my whimsy centerpiece came from the faux grass that I never knew what to do with for almost a decade and everything fell into place from there. I smile every time I see it on the dining room table. Good luck and have fun with your wooden garden tool box! 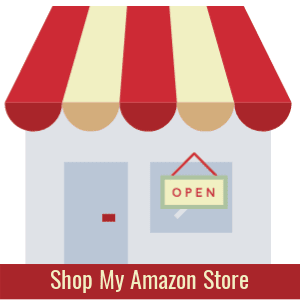 Thank you for the pin and share, Marilyn! Thank you so much, Julie, I'm glad you like them. Happy Easter!